Pull together episodes from different podcasts. 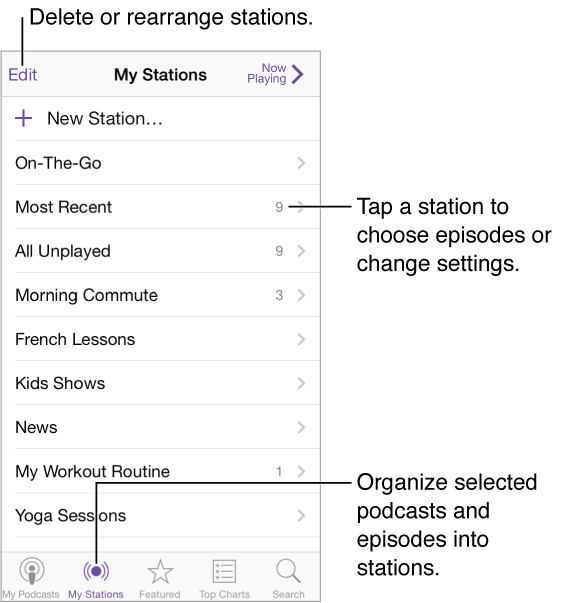 To add episodes to your On-The-Go station, tap My Stations, tap On-The-Go, then tap Add. Or tap next to any episode in your library. You can also touch and hold any episode, then tap Add to On-The-Go. Create a station. Tap My Stations, then tap . Change the order of the station list or the podcasts in a station. Tap My Stations, tap Edit above the station list or the episode list, then drag up or down. Change the playback order for episodes in a station. Tap the station, then tap Settings. Rearrange your podcast library. Tap My Podcasts, tap list view in the upper right, tap Edit, then drag up or down. List oldest episodes first. Tap My Podcasts, tap a podcast, then tap Settings.